This month we would like to congratulate the Gold Standard 4-H Club for being awarded the Nebraska 4-H Club of the Month for May 2017. This Club from Burwell, NE, in Garfield County, has truly made a difference in its community. The club is dedicated to building strong citizenship and teamwork through various activities. The club had a dream of starting an archery program for all the youth of the county and neighboring counties to enjoy. They knew it wouldn’t be easy, but they set their sights on some grant funds to make it happen. The Gold Standard Club’s actions were rewarded when they were recognized with the Governor’s Agricultural Excellence Award in 2016 and the corresponding grant. They also found funds locally through the Calamus Area Community Foundation and through local connections with the National Rifle Association and the National Wild Turkey Federation. The Gold Standard members knew that money wasn’t the only thing needed to accomplish their goal, so they planned Archery Fun Day. This event allowed the youth of Garfield, Loup, Wheeler and Valley Counties to learn just how fun archery is. They featured several archery stations with different challenges, a delicious lunch and raffles. Aside from earning more money for archery equipment, the Gold Standard Club created a lot of interest for archery and 4-H in the area. As a result, their club has experienced growth in numbers that has also created growth in the overall number of 4-Her’s in Garfield County. 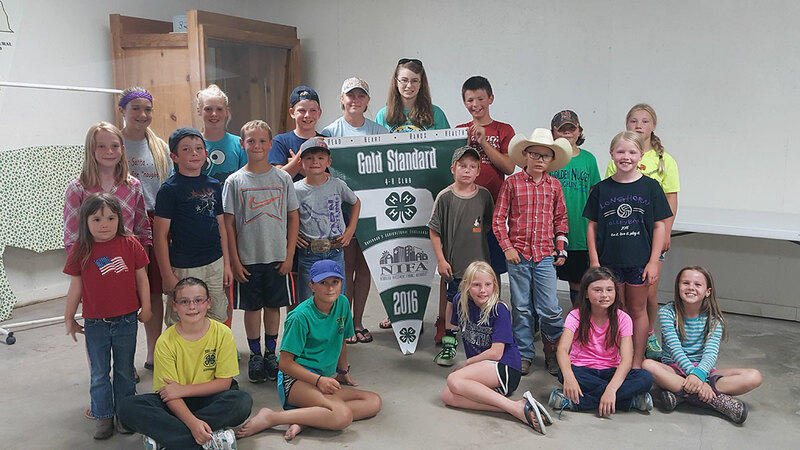 Aside from their accomplishments in establishing archery as a premier project in Garfield County, the Gold Standard Club has continued to set the “gold standard” for excellence as a 4-H club through their regular meetings, leadership development and annual community service projects. The Nebraska 4-H Foundation provide the 4-H Club of the Month program to all Nebraska 4-H clubs throughout the state. Clubs can nominate themselves by telling why their club should be chosen as Club of the Month. A different club will be chosen each month and will be awarded with a certificate and $50 cash card. For more information go to the Nebraska 4-H Foundation website at http://www.ne4hfoundation.org/recognition or e-mail ne4hclubofthemonth@gmail.com. For more information contact the Lincoln County Extension office at (308) 532-2683 or e-mail lincoln-county@unl.edu. No Comments to "May 2017 Club of the Month"